The Who’s Who of Owls: The North American Spotted Owl. Owls belong to a group of birds that includes about 205 species. They are known for their distinct calls, nocturnal habits, and silent flight, and are sorted into two basic groups—barn owls and true owls. 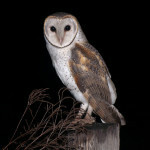 Barn owls have a heart-shaped face, long legs and powerful talons. True owls are more diverse, lacking the heart-shaped face, and include screech owls, horned owls and the Northern Spotted Owl. Owls are predators and feed on small mammals such as mice, squirrels, voles and rabbits. They cannot chew their prey since, like all birds, they do not have teeth. 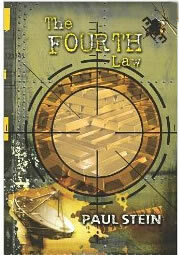 Instead, they swallow small prey whole or use their sharp bill to tear their food into small pieces before swallowing. They later regurgitate pellets of indigestible material such as bone, fur and feathers. Most owls are nocturnal and hunt at night, avoiding competition with daytime avian hunters such as hawks and eagles. Possibly the most fascinating characteristic of owls is their adaptation of special flight feathers for silent flight. Downy feathers cover the surfaces of the wing which enable them to minimize the sound made when flapping their wings. Owls also have an acute sense of hearing that helps them locate and capture prey. In some species, the ears are located asymmetrically to enhance their ability to pinpoint the origin of the sounds they hear by sensing the minute difference in the time that sound reaches each ear. These characteristics make owls silent and deadly predators. The Northern Spotted Owl: Strix occidentalis, is a nocturnal woodland owl which stands about 18-20 inches tall. They are darkly colored and heavily spotted with white on the breast and belly, with less spots on the wings, back, and head. Spotted owls are placid birds, allowing close approach by humans and may even be reluctant to fly. 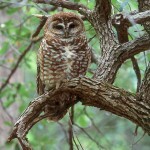 When roosting, a spotted owl will sit on a branch, near the trunk, where it is camouflaged against tree bark and shadows. They roost in deep shade during the day, hence their kinship to old growth forests. The call of the Northern Spotted Owl is a mellow, 4-note hoot, “Whoop wu-hu hoo” which lends them their nickname: the hoot owl. The owl breeding season is from March to September. Timing and success in producing offspring are strongly linked to the availability of prey, and not all pairs breed every year. Spotted owls mate for life, but a new mate is readily taken if the other disappears. Spotted owls are long-lived, with captive owls of 21 years being known. Natural predators of the spotted owl include the Great Horned Owl, which preys on both adults and young; the Red-tailed hawk, which preys on young; and the common raven, which may destroy eggs. Like the proverbial canary in a coal mine the Northern Spotted Owl is considered an indicator species in old forest habitat. They inhabit dense, dark, old-growth or mixed mature and old-growth coniferous forests. Their habitat is usually dominated by firs, but they also use mature hardwood forests of cottonwoods, alders, oak, and sycamore, especially along steep-walled river valleys. They prefer an uneven and multi-layered canopy, and shaded mountain slopes and canyons over flat plateau areas. The Northern Spotted Owl may be the most publicized of all endangered species in North America. Because of its dependence on large tracts of old-growth coniferous forests, management for this owl has caused tremendous turmoil in the timber industry, and has generated an incredible amount of research. In June 1990, after years of heated negotiation and litigation between the government, environmentalists, and the timber industry, the Northern Spotted Owl was declared a threatened species. Under this provision, timber companies are required to leave at least 40% of the old-growth forests intact within a 1.3 mile radius of any spotted owl nest. Timber Industry representatives claim that the measure has left thousands of Northwest loggers and mill workers jobless, and insist that such protectionist policies fail to take into account the dire economic consequences of preservation. Environmentalists, on the other hand, argue that society has a fundamental obligation to preserve this rare species and the wilderness it inhabits. Regardless the pros and cons of owl protection, these nocturnal predators are a fascinating species. 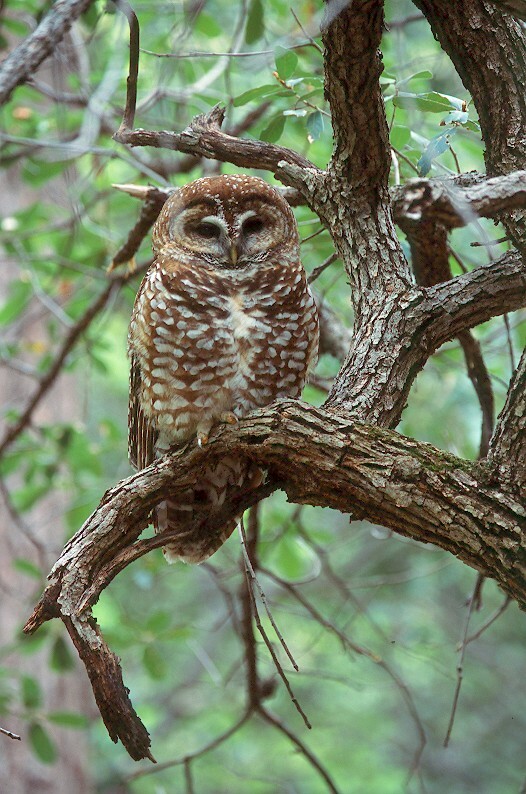 If you are fortunate to hear the spotted owl’s territorial cry: “ Whoop wu-hu hoo…remember to answer back—wu-hoo-who, as this is one of the most celebrated and famous birds in the Calaveras wilderness.